SC16 is the 29th year of the SC Conference series – once again featuring an exceptional Technical Program, Industry and Research Exhibits, Education Program and many other activities. SC16 is the one place where attendees can see tomorrow’s technology being used to solve world-class challenge problems today. Conference attendees, click here to register. Exhibitor Booth Management, click here to register. Media Professionals: Use the form at the link below to request a press credential. Requests are subject to approval of the Media Chair and verification of information provided, click here to register. Click here to view the SC16 Full Program. To view Registered Press, click here. Grid showing access to sessions by registration category, click here. Please note: You must be at least 16 years old to enter the exhibit floor. SC16 is pleased to offer on-site childcare services during the conference this year for a small fee. Please refer to the SC16 website at http://sc16.supercomputing.org/attendees/on-site-child-care/ for additional details and sign-up procedures. 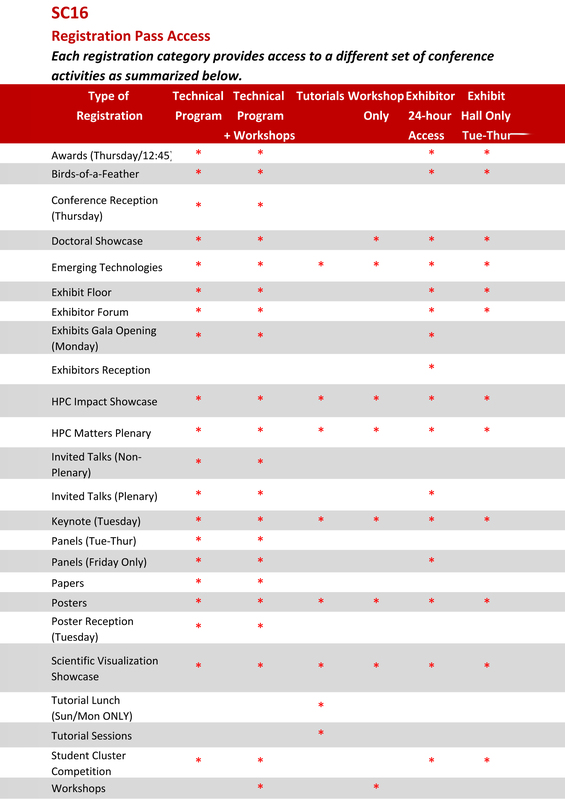 The Technical Program fee includes admission to all conference sessions, exhibits, the Monday night Exhibits opening event, Thursday night event, and one copy of the SC16 proceedings. There will be two days of Tutorials and two types of passports available for purchase: a One-Day (Sunday or Monday) Passport or a Two-Day (Sunday and Monday) Passport. The fee includes admission to any of the Tutorials offered on the selected day for a One-Day or Two-Day Passport. Please note: There is no Half-Day Tutorial option. The fee also includes lunch on the selected day(s) and electronic access/download to all the Tutorial notes (Please note: to receive a USB Flash Memory device containing Tutorial notes, there’s an additional $5 charge). For each tutorial day included in your Passport, you must select one preferred full-day tutorial or two half-day tutorials. Regardless of your preference, you may attend any tutorial(s) on a day included in your Passport. The tutorial fee also includes a set of tutorial notes in electronic form and lunch for each day included in your Passport. Admission to Exhibits Only $150 (access to exhibit hall Tuesday, Wednesday and Thursday – does not include admittance to the Monday night exhibits opening event). Note: Exhibits are included in the Technical Program registration. International visitors should be particularly aware and careful about visa requirements, and should plan their travel well in advance. To streamline the visa letter process you must register and pay (in full) your registration fee for SC16. Once you have registered, you may return to the Registration site to print your visa letter. Simply sign in using your registration ID and the email address used for registering. Click on the button “Print a Visa Letter of Invitation” and your letter will appear.